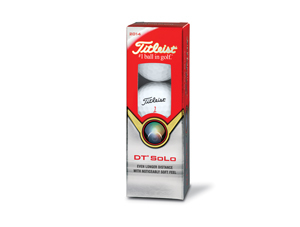 The 2014 Titleist DT SoLo golf ball is one of four new Titleist golf balls for 2014, alongside the NXT Tour, NXT Tour S and Velocity. The 2014 Titleist DT SoLo has been designed to provide a combination of increased distance on full shots, softer feel and control around the greens. It retains its super soft compression, fast core and soft ionmer cover from the previous Titleist DT SoLo model. The main change is a spherically-tiled 376 tetrahedral dimple design, which provides a more consistent surface coverage, translating to a more consistent flight and increased distance off both fairway and tee. 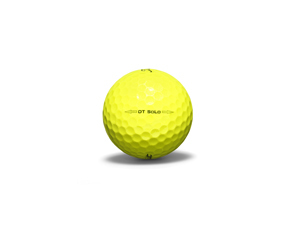 The 2014 Titleist DT SoLo is available in both white and optic yellow and comes with a suggested retail price of £18 per dozen.